Yesterday, I took advantage of the 15C weather for a lunchtime 20K ride along the Muromi River (see related page for more photos). While the weather was warm and sunny, the wind was absolutely BRUTAL. I had a head wind while I was riding away from the city and I swear that I only benefited from a tail wind for 5 minutes on the way back into town. The wind sucked up a lot more of my energy than usual, so I stopped by my favorite ride lunch depot on the way back home, Karatsu Burger (near Meinohama). I recharged my tank with 2 “specialty” burgers. I’m getting hungry just thinking about those burgers, mmm. 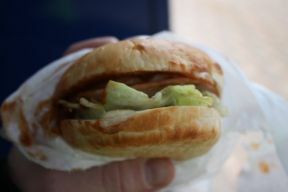 The reward at the end of the ride, Karatsu Burger! One of the first things that I noticed about Japan was the large number of people riding bikes along the wide sidewalks here in Fukuoka. After witnessing several near-miss bicycle accidents, it struck me that no one wears a helmet while they ride their bike. Some riders even like to temp fate by ride their bike down the sidewalk at night while simultaneous texting on their mobile phone. As a result, I am probably looked at as the “crazy gaijin” who rides his mountain bike on the sidewalk while wearing a helmet. Last Thursday, I was at the scene of an accident where I witnessed the reality of what happens when you don’t wear a helmet. That day, a friend and I had ridden from Akasaka out to Itoshima for lunch. It was an overcast day, but the rain held off for the entire 60 km ride. We had just turned left onto Meiji-dori with about 10 km left to go on the ride. There was a K-truck parked on the sidewalk that was getting to back-up onto the street. Further ahead, a bus was in the turn lane, coming toward us. After the bus past us, we heard a horrible CRUNCH, and then the sound of metal sliding on pavement. We stopped and turned around to see a scooter bike lying on its side in the middle of the intersect. We went back to see if we could help in any way. The female motorist was lying on her back and completely immobile. The bus had come to a complete stop and was right next to the woman. She was very fortunate that she didn’t hit the bus head-on when she swerved around the K-truck. She had a knot under her eye and a giant gash on her forehead where bone was visible. We stood and directed traffic around her while we waited for the police and ambulance to show up. Fortunately, she started coming around when the ambulance showed up to put her on a back board. After that gruesome scene, I’m resolved to be the strange guy around town who rides with a helmet on. There was actually snow on the ground at the top of the trail-head. It took me a little time to get my position on the bike correct for going downhill. It wasn’t like road cycling at all. Actually, it felt more like skiing with the way you have to keep your weight back and over the rear tire. Needless to say, I learned this the hard way when the front tire dropped into a small depression and then stopped…while I continued forward over the bars and onto the trail. Through the ride, there were a few more spills, but I mostly avoided the rocks, logs, and giant puddles. It was a tremendous trill to ride downhill fast and snaking through the trail to avoid the trees, boulders, and roots. I’ll definitely be on the trail again. The next time, I might actually know what I’m doing from the start. Despite the great time that I had with the MTB, I still really enjoy the convenience of grabbing my road bike and going for a ride along the Muromi River. I was thinking about the difference during my road ride today (Sun). Even though both sports use bikes, they seem completely different. MTB provides the same thrill as skiing downhill through the woods while searching for powder. Road cycling provides the speed and enjoyment of driving with the top down along a coastal hwy. I think that I definitely have time for both sports. In order to get the Anchor rideable, I had to apply some TLC to the drive train. I was amazed at the amount of dirt, sticks, etc that was caked into the rear cassette. 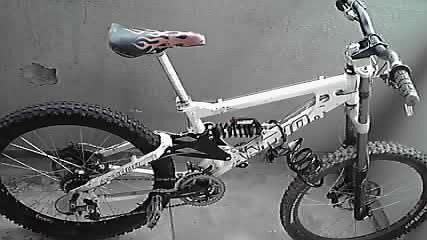 Once I had the rear cassette cleaned out, I was able to install the 9-speed chain (Shimano CN-HG93). I have Sheldon Brown to thank for the great instructions (http://www.sheldonbrown.com/derailer-adjustment.html). When installing a new chain, wrap the chain around the largest diameter from and rear gears without going through the rear derailleur. Take out any slack in the chain and include one more link. This will get the chain to the correct length. 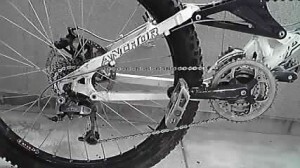 Before connecting the loose ends, string the chain through both the front and rear deraileurs. I ran the bike successfully through all of the gears, so no further tuning was needed with the derailleurs. Unfortunately, I uncovered also discovered that the rear brake disc was warped and needed to be replaced. I’ll drop off the bike at the bike shop in the next few days to replace the brake fluid and install a new rear brake disc. I arranged a lease agreement with a friend where I would fix up his neglected mountain bike and he would allow me to ride it for the next year while I was in Japan. I need to add brake fluid, install a new 7-speed chain, then tune the shifting. Hopefully, the rear shock doesn’t need to be replaced (or is at least tolerable). A pretty picture of the Anchor is coming soon. Currently, the bike is as rideable as the name “anchor” implies.